Mattel has announced they will be releasing a bald Barbie. At this point, the plans are to donate dolls exclusively to hospitals and the National Alopecia Areata Foundation. MGA Entertainment also said they will be creating Bratz with no hair to sell at ToysRUs, with 1 dollar from every purchase going to cancer research. I got kind of weepy happy about it. It's a wonderfully green idea for lunches! Buying larger containers of yogurt is less waste. 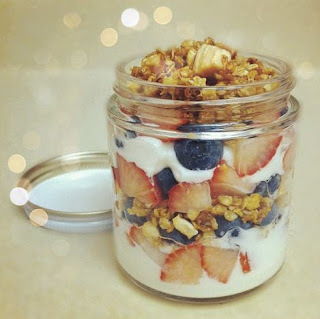 You could use berries from your garden, and homemade granola. I prefer making yogurt from scratch. Some times I use packaged cultures, other times, plain organic yogurt from the grocery store. One small container will inoculate two batches of yogurt. Kefir is essentially reusable for forever. Yogurt isn't, after the 3rd or 4th generation, it gets pretty icky. This is the method I use with a popular brand of freeze dried cultures that's fairly widely available. Dissolve the powdered milk into the milk, and bring to a light boil, turn down heat and keep at a simmer for 10 minutes. Let cool to lukewarm. Pour a little bit of the lukewarm milk into a non-reactive container (glass or ceramic), I use a white ceramic casserole pan I can cover with a plate. Mix the starter into it and stir to get the lumps out and make sure it's dissolved. Pour in the rest of the milk and stir it up well. While you're doing that, stop your sink and run very warm water in it. Just about "Nice hot shower" temp does nicely. When it's about 2 inches deep, turn off the water and put the yogurt container into it covered with a plate or lid if your container as a lid. Every so often during the day, stop and check your water temperature, if it's cool, take out the yogurt container without peeking or stirring, and refill the sink up to 2 inches with more warm water,then replace the yogurt container. After about 8 hours, check it by tilting the dish and seeing if it's runny or firm set. Firm set, it won't move but may have some whey on top. That can be poured off or stirred back in. Put it in the fridge. The warm temperature encourages the cultures to work and multiply. The reason I use the powdered milk is as a natural thickener. My son loves homemade vanilla yogurt. I use vanilla extract and honey to sweeten. If your yogurt doesn't set as well as you would like, you can use it in smoothies. My mom, who was a yogurt making hippy used pour improperly set yogurt into jam jars with just a bit of jam left in and stir it up really well. Then she would put the mix into ice pop molds and freeze it for a great summer treat. The yogurt instructions were previously posted here with more nutritional information. Have you tried using a crock pot instead of the water bath method? I'm going to try it this week! I haven't yet because the water bath works so well. Let me know how it goes! The last week- with photos! I have no idea what happened.I'm so sorry. Book Review- Better Homes and Gardens Can It!